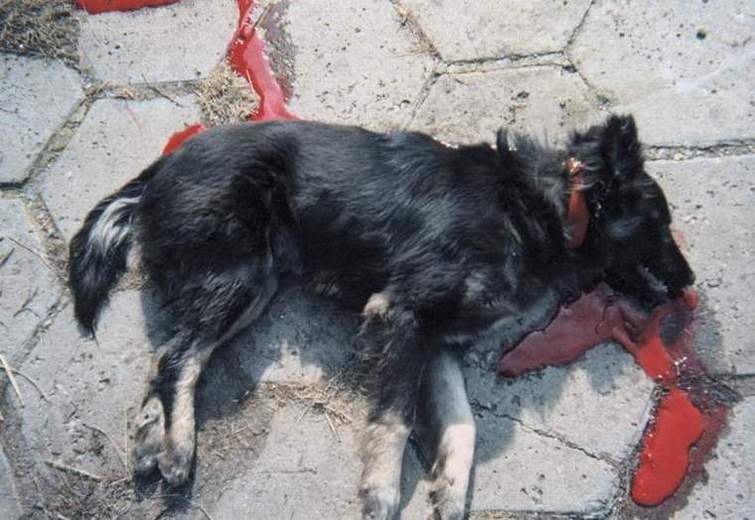 A citizen of the capital [Sofia], presenting himself as a military prosecutor, shot dead a nine-month old dog before the very eyes of its owner Gueorgi Gueorgiev, chairman of the regional centre for the protection of animals. "The incident took place on Thursday morning in front of block 501 of the Lyulin Residential District", Gueorgiev complained. The man was walking his other three dogs on leads, and had let the smallest one run alone (the murdered dog had been castrated under No. 03019 at the German Castration Centre and was not dangerous). While the dogs were enjoying their morning walk, a man appeared, about 180 cm tall, with dark, slightly curly hair, dressed in a leather overcoat, black trousers and carrying a small leather bag in hand. The little dog approached him and merrily wagged its tail. "Suddenly, he drew out a pistol and fired at it. No shot was produced. The little dog decided that he would be playing with it and lay at his feet", Gueorgiev said his eyes watering. The man dressed in black charged the gun and mersilessly fired again. That time the dog bled heavily and passed away. A group of small children witnessed the bloody murder and started shrieking terrified. "Why did you fire? ", Gueorgiev asked shaking and ran after the executioner. "I am a prosecutor and it's my business! ", the latter snapped and headed to the parking lot of the local café and pastry shop. Gueorgiev rushed after him. The prosecutor tried to strike him in the face and then kicked him. The guards of the parking lot left the dog killer escape across the fence and when police came, the shooter was no longer there, Gueorgiev claims. Offiials of the 9th Regional Police Dept. took a photo of the place of shooting and took the fired cartridge. They also collected evidence of the witnesses. Gueorgiev learned from neighbours that the escapee was indeed a military prosecutor, living in block 504 of the Lyulin Residential District of the capital. After private investigation, the Noshten Troud newspaper established that Prosecutor Nenkov was living there, but it was not yet clear whether this had been him. "I have no information about anything of the kind", one of his sons, claiming anonymity, said on the phone. Gueorgiev has lodged a claim at the 9th Regional Police Department. Original title: "Прокурор застреля куче пред деца"